Every year Beth and I try to ski into the new year with at least a few days of skiing and van camping. In past years we have gone to Anthony Lakes or Mt Baker ski area, but this year we wanted to go a little bigger and see something new. There were several (somewhat) nearby ski areas that Beth and I had never been to – or at least, hadn’t been to in a long time. So we decided to put a multi-day multi-destination road trip together in the last days of 2018. 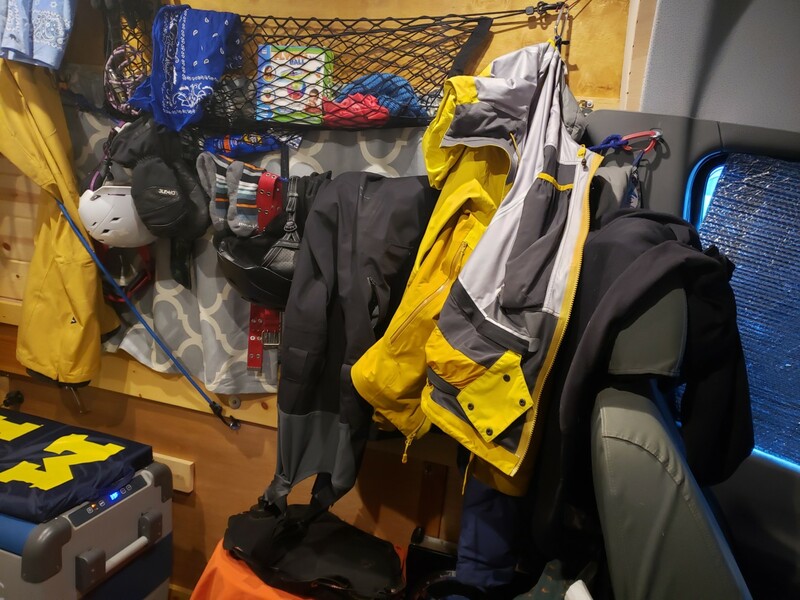 During a ski trip – the more places to hang stuff to dry the better! 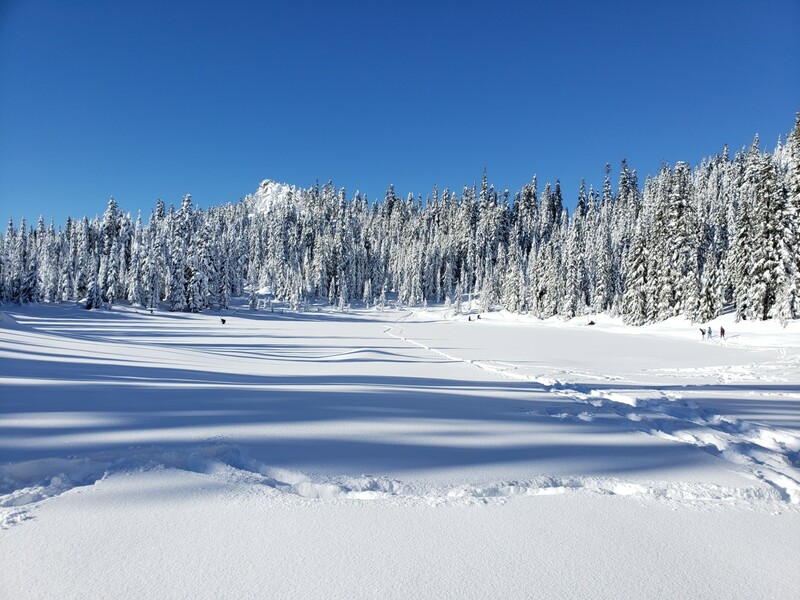 December 26 – 27: White Pass, Washington – so good we decided to spend another day there. 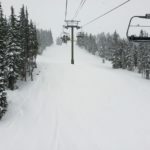 December 28: Schweitzer, Idaho – long runs of beautiful groomed corduroy, but COLD! 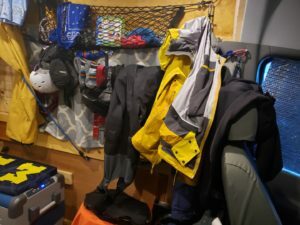 December 29 – 30: Whitewater, British Columbia – steep and deep. beautiful long powder runs. And holy crap the kids here are good skiers! 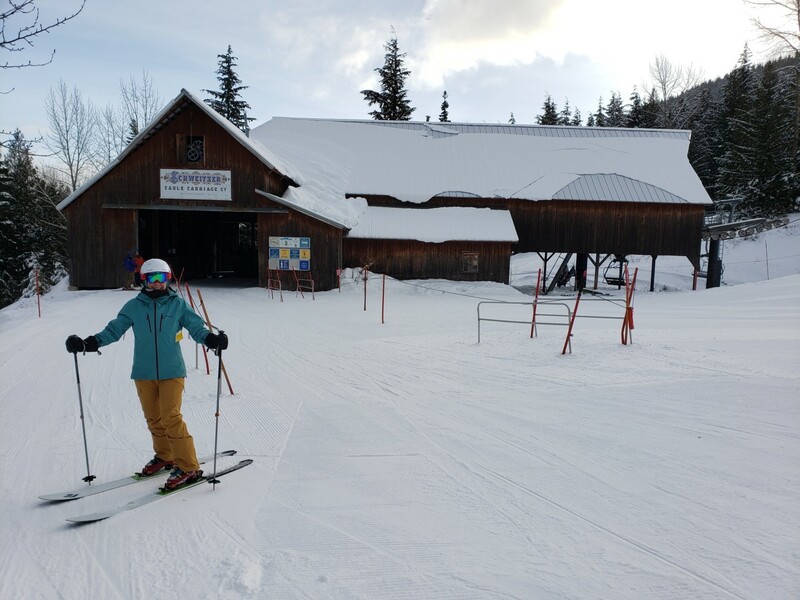 December 31: Stevens Pass, Washington – inbounds was a mess with Seattle crowds, but the backcountry was great (though still crowded). 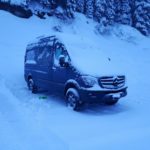 Below are a few highlights and logistics for future ski vacation planning. 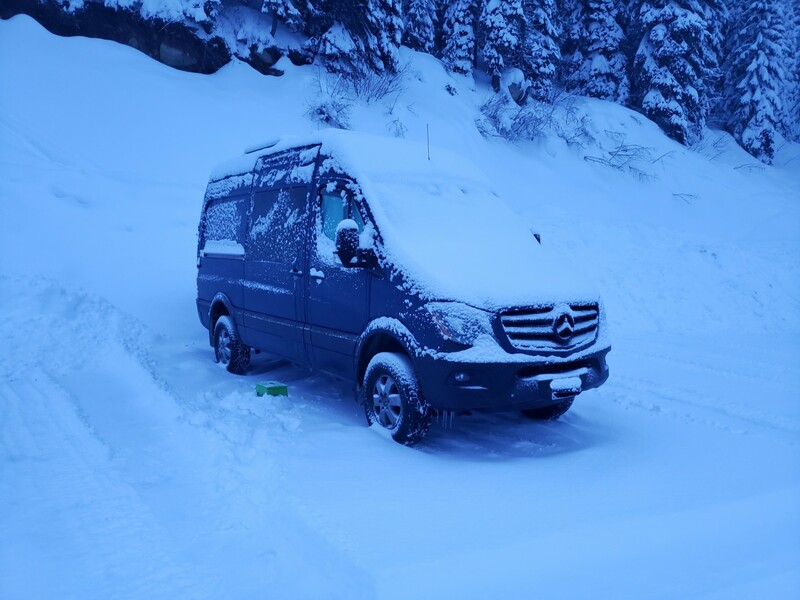 We’ve highlighted the current van camping / RV regulations, but be sure to check with the ski areas before you arrive – as these rules are subject to change. Several laps of lovely powder turns. While White Pass is only a few hours drive from our home base, we hadn’t been out that way in a long time (since circa 2002). 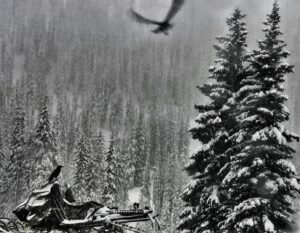 In the years between, White Pass has added two new lifts (both quads; Basin and Couloir), which added a significant amount of new terrain to explore. Few crowds, even for powder days and a holiday week. 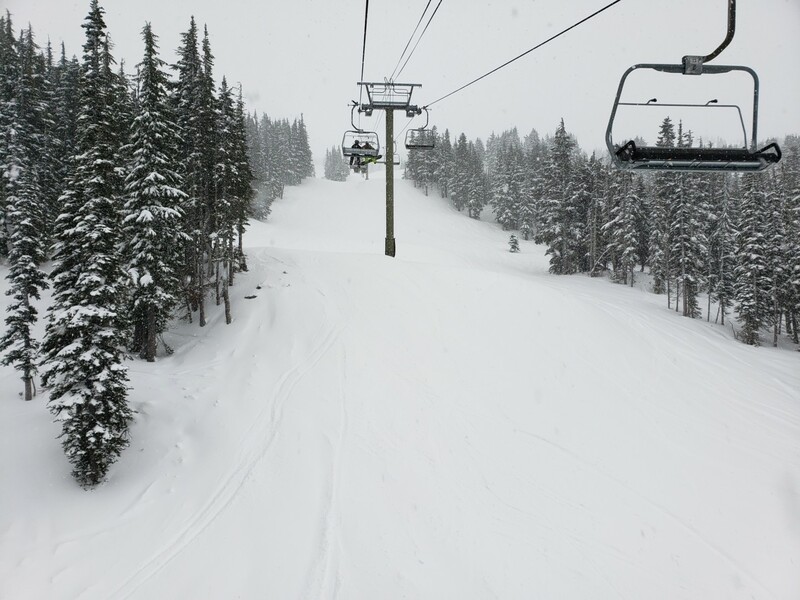 Beautiful wide open bowls and widely spaced trees that were easy to ski – particularly off the new (2010) Couloir Express chair. Not a lot of significantly steep terrain, but plenty of fun skiing. Both a mid-mountain lodge and a yurt (!!) for mid-day refreshments. 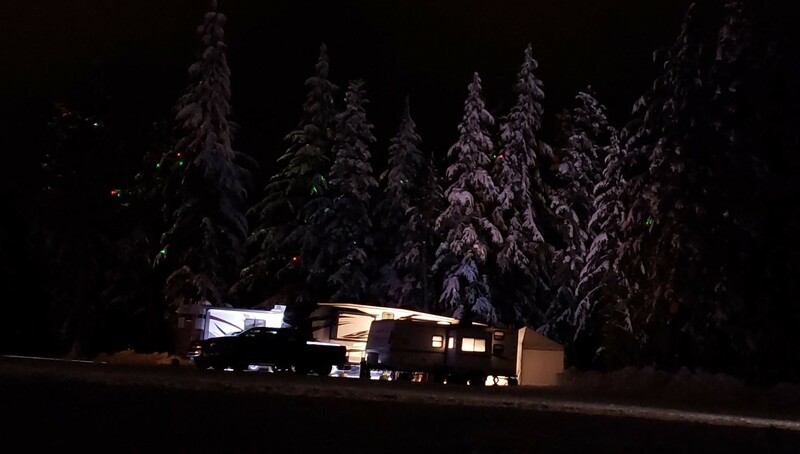 Our RV neighbors provide some holiday lighting effects in the trees. Vans and RV’s are allowed to stay FOR FREE (as of this writing) in lot C, which is located just east of the main lodge. There are no hook-ups, but the parking lot is large and flat. You can ski right down to it at the bottom of the ‘Far East’ lift, but it’s a little bit of a hoof to get to the main lodge in the morning. There isn’t a lot going on at White Pass at night, beyond what the main ski lodge has to offer. There is also a small store called the Kracker Barrel Store and Services, but we didn’t check it out (I believe they have limited winter hours). The nearest restaurants and grocery stores are in Packwood, which is about a 30 minute drive away. 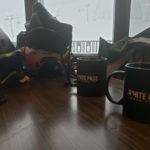 The lodge itself offers the usual assortment of food and beverages and the prices are actually not too bad (compared to the usually price gouging at ski areas). Cruising on up to northern Idaho was a bit of a drive, but worth it. 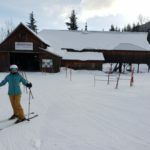 Schweitzer itself is an interesting kind of ski resort – sitting just outside Sandpoint, Idaho, it feels like its going for that big expensive resort feel (think Park City or Whistler), but it’s still in northern Idaho. So the base area has that classic alpine chalet look with a number of retail spaces (though most of them appeared to be real estate?) but the lift ticket prices are steel less than $100. The lower lift access for Stella looks like an old barn – which is pretty cool. 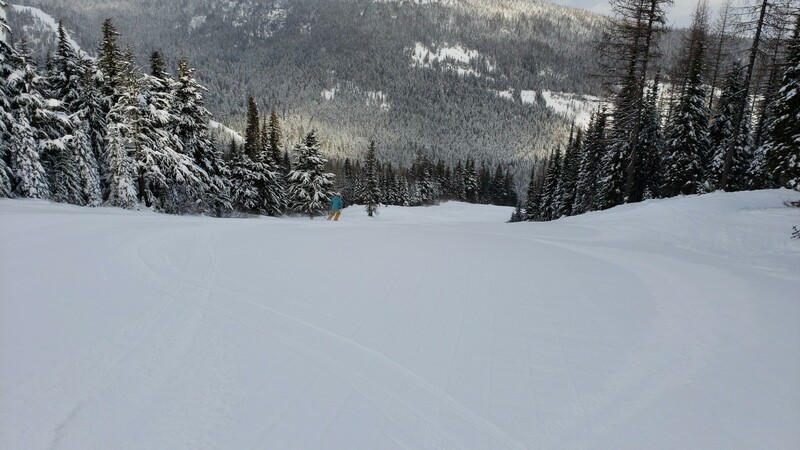 Although we didn’t hit Schweitzer on a powder day (giving it an unfair disadvantage to review from), we did have a great time skiing the beautifully groomed corduroy ski slopes. 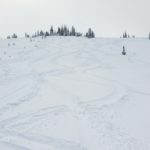 The runs on the backside or “Outback Bowl” were particularly fun – with some great steeps (that would have likely been amazing on a powder day) off of the Snow Ghost double chair and some fast and fun cruisers off the Stella six chair. 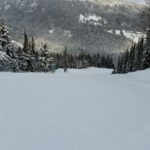 On the front side (“Schweitzer Bowl), the Great Escape quad and Lakeview triple also offered some fun and steep skiing. Again, conditions here didn’t give us the best Schweitzer had to offer, but we definitely saw the potential in the available terrain. If lift tickets were cheaper or if camping would have been free we might have stayed longer. 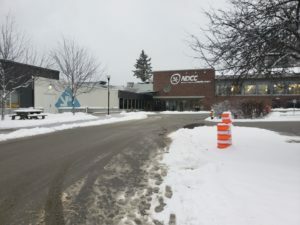 Schweitzer allows RV parking at the north end of the Gateway parking lot. 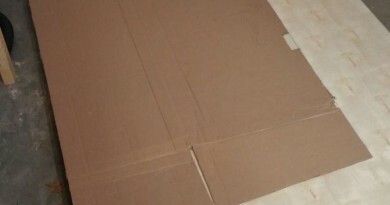 The cost is $20. The Gateway lot is located just down from the main village parking lot, to the right as you reach the top of the hill. If you get to the pay toll-booth you have gone too far. The lot has some flat spots, but they aren’t really located at the north end of the parking lot (where they say they want you to park). This didn’t seem to be a problem when we were there, but if it was snowing a it might be. More information on RV parking at Schweitzer is available here. We did not get to check out the restaurants or night life in the Schweitzer village as we got in late the night before we skied and took off in the early evening. From Schweitzer we continued our van ski road trip up across the border and into Canada. 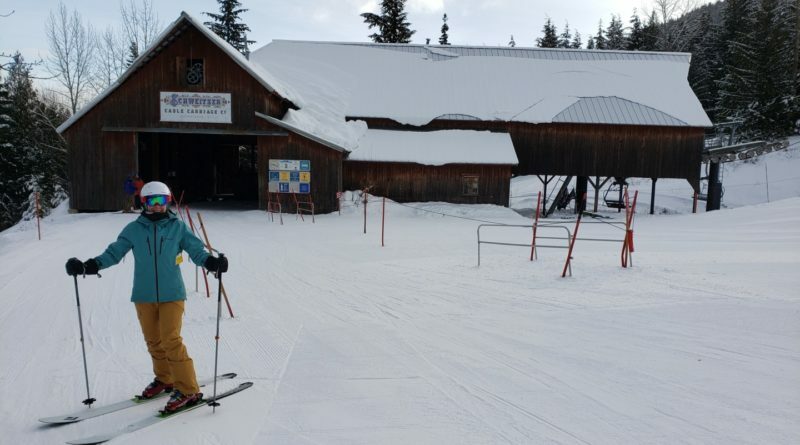 Whitewater Ski Area is located just outside of Nelson, BC – which is a cool little town on the southern bank of Kootenay Lake. 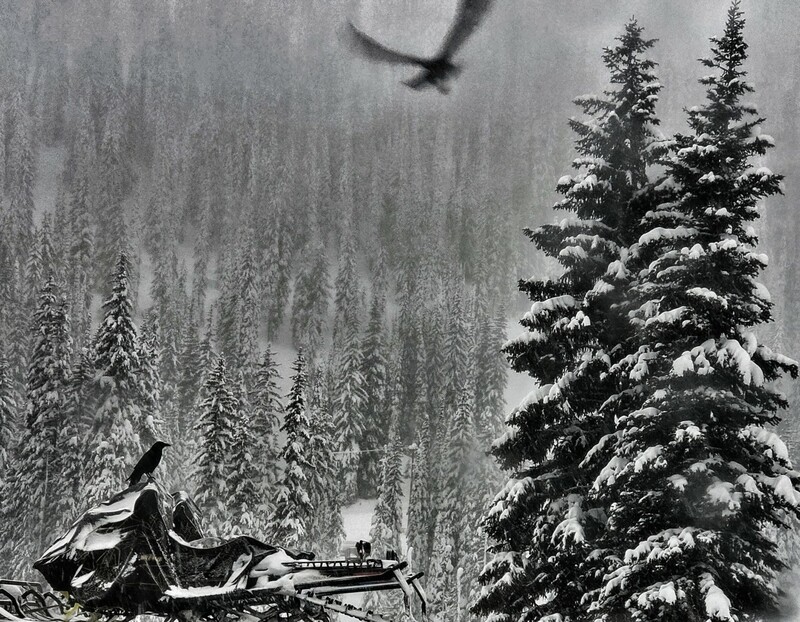 Nestled in the Selkirk mountains, Whitewater Ski Resort averages over 400″ of light dry snow every year (and maybe some not so light snow too). 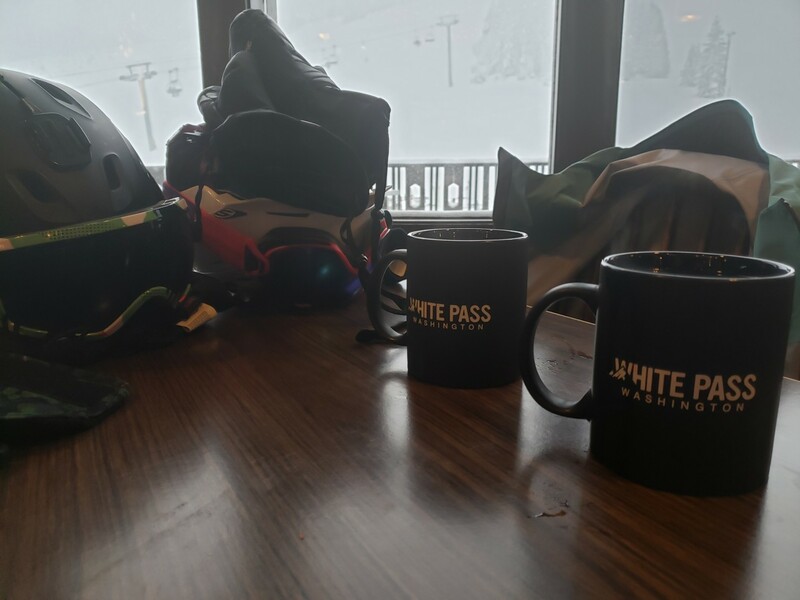 We lucked out with two days of amazing snow during our stay at Whitewater (you might even say we planned it that way). With only three lifts, its hard to go wrong, but we found the best skiing to be off the Summit and Glory Ridge chairs. Anything accessed from the Glory Ridge Chair. 2,000 vertical feet of pure bliss. Overnight parking is permitted at Whitewater Ski Resort in Lot 3. The cost per night is $25 + tax (Canadian $, not sure what the tax was – didn’t convert to much). 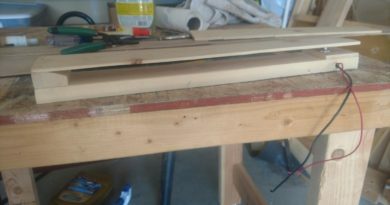 A map with the rules and regulations is available on their website. The lot itself is actually not particularly flat, but the snow plows did a good job when we were there of creating several good flat spots to park. 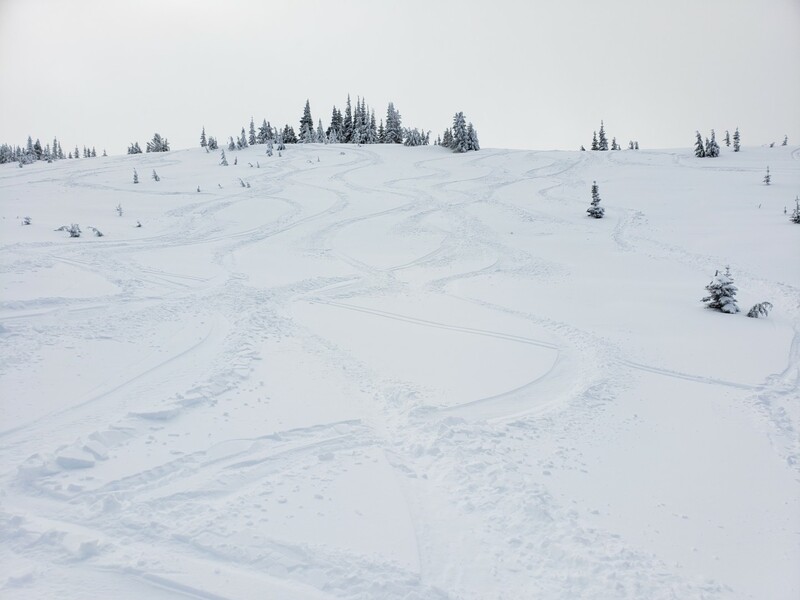 This is technically the nordic/backcountry lot and it’s a bit of a walk to get to the main lodge – thought there appears to be some epic backcountry available right there, if you are so inclined. We left the ski area for one evening to clean up and get a good restaurant meal. #Vanlife is extra good in British Columbia as several of the towns have these excellent recreation centers that have (among other things) pool, hot tub, and shower facilities. 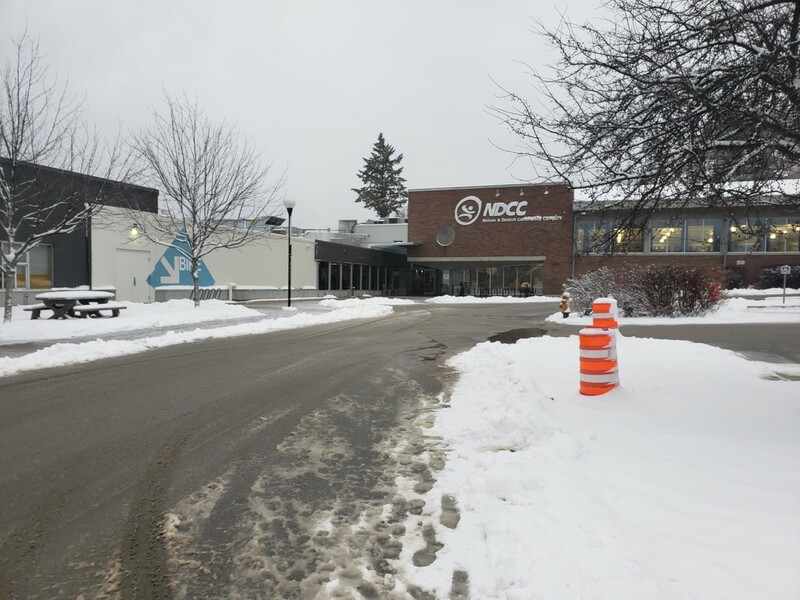 Nelson is no exception and the Nelson & District Community Complex offers an aquatic area, fitness center, and ice rink. The staff at the complex were extremely friendly and got us hooked up with a daily entrance pass and a lock to use with their lockers. Total cost was around $10 for both of us. Once we were relaxed and clean we checked out the town of Nelson. It was quite the bustling downtown area, but we had a great meal at the rustic and relaxed feeling Jackson’s Hole & Grill. For the final ski day of our trip, we headed south again. Our original plan was to do some skiing around Mt. Ranier – but due to government shutdown, the upper access to Paradise was closed. So we headed to familiar Stevens Pass instead. Of course, the Seattle crowds flooding the ski area on a weekend combined with Vail Resorts (who recently bought Stevens Pass) new pricing scheme made lift-access skiing there not very desirable. Instead, we headed into the comfortable backcountry just across the highway. Cruising up the access road. 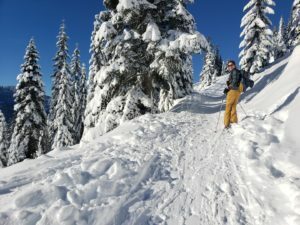 The Outdoor Project has some great write-ups on the backcountry skiing around Stevens Pass, so rather than re-hash their excellent information, I’ll just provide some nice photos. We had a great time safely skiing the backcountry around Skyline Lake. The snow was very deep and forgiving, though the trees up there are pretty tight (not recommended for beginners). This area sees quite a lot of snowshoe traffic (in addition to backcountry skiers) but this didn’t really detract from the overall experience – since you are mostly just going up a radio/cell tower access road to get to the top anyway. The snowshoers and families mostly stick to the beaten path, leaving plenty of untouched glades to be enjoyed by skiers. Stevens Pass does allow RV camping, but the lot is quite busy and the cost $40/night. 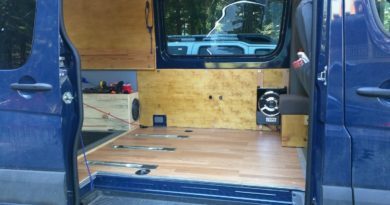 They recently went to a complex reservation system, which is likely a good thing, but doesn’t really lend itself to the spontaneity of #vanlife. 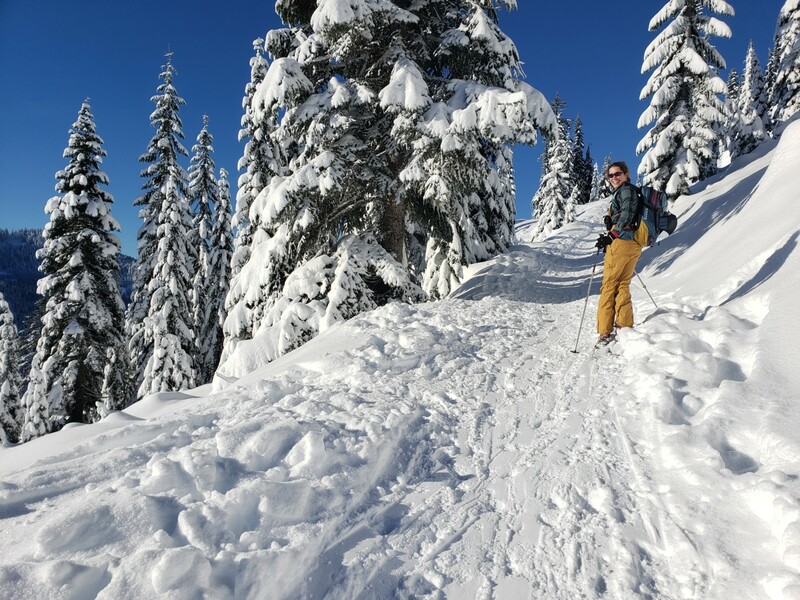 Instead, our general go-to for camping near Stevens Pass is the Nason Creek rest-area about 20 miles east of the ski area or the overnight parking lot on the right as you enter Leavenworth (from the west). Both have their own set of rules which you should research if you stay there. The town of Leavenworth has some fun night life, having reinvented itself as a Bavarian-styled village in the 1960’s. There are lots of fun shops and restaurants to explore. 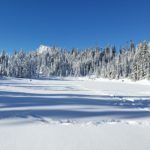 Having frequented the Leavenworth area for skiing and mountain biking over the years, we have enjoyed lots that the city has to offer – honestly, it’s hard to go wrong. Great trip overall. Yes, of course we put a corny video together, which captures some of the highlights (mostly Beth skiing deep powder). We made a little video of our ski trip. Yes its corny, but fun!